This special 10X magnifier features a 12 mm scale marked in 1 mm increments and a 1/2" scale marked in 1/8" increments marked on the square fold-out metal frame base. It is housed in a vinyl case. 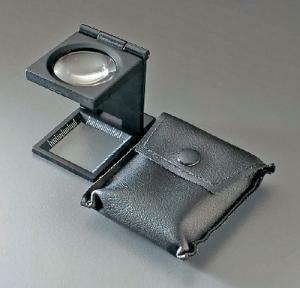 Size: 1 1/4"L x 7/8"W folded; 1 1/4"L x 7/8"W x 1 3/8"H set up; lens 5/8" dia.